See you in Lyon ! 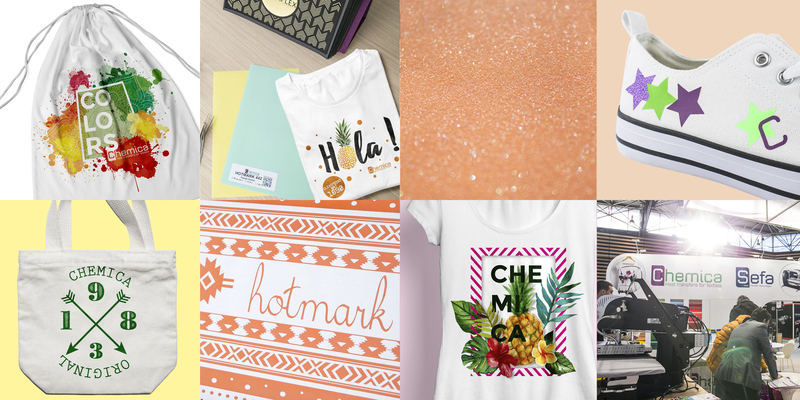 Chemica provides a range of innovative, high-quality, stand-out products for the visual communications, screen printing and textiles markets. NEW ! Discover our new CHEMICA tutorial videos ! For more information, visit our Youtube channel ! Chemica is a manufacturer of heat-transfer films for textile applications, founded in Saint-Etienne, south-east France, in 1983. Chemica has over 30 years of specialist experience in manufacturing heat-transfer films for the textile printing market. We are recognized as offering the most extensive choice of 60-micron film colours with our Hotmark line. We are also noted for our Quickflex film, which can be applied in just 5 seconds, and for our wide selection of other films in a range of sparkling and glittery, glossy, 3D and velvety textured effects that are also available in printable media for flocking T-shirts, bags, awnings, and much more besides.